Ready for the Official Champagne Grand Tasting at the International Wine Tourism Conference? After a full day of visiting thirty exhibitors, attending a plenary session and several other sessions, attendees at the 7th Annual International Wine Tourism Conference will likely want to quench their thirst. What better place in the world to have the conference than in Reims, France? Those attending the conference will have the opportunity to taste and enjoy different champagnes by several producers at the Official IWINETC Champagne Grand Tasting. What can attendees expect during the Grand Tasting? There are thousands of unique champagnes. What makes them different in part is due to terroir, but a large part of their difference is the creativity of the cellar master. Participants in the Grand Tasting can taste the differences. Although many of the champagnes at the Grand Tasting are blends of two or three of the main champagne grapes, enthusiasts can sample single varietal champagnes. Champagne Nicolas Feuillatte’s Brut Chardonnay Vintage is made entirely of Chardonnay. Champagne Bonnet Ponson will pour a 100% Pinot Noir with their Jules Bonnet Extra Brut 2008. For Pinot Meunier fans, Champagne Dom Caudron has two champagnes made with 100% of this variety. Nine of the Grand Tasting producers’ champagnes are single variety. Less daunting may be comparing the grand cru and premier cru champagnes. Champagne Michel Gonet will offer two Grand Cru champagnes, Blanc de Blancs Grand Cru 2008 Extra Brut and Cuvée Authentique 2005 Blanc de Blancs Grand Cru Extra Brut. Champagne Bonnet Ponson will pour a premier cru with their Champagne Brut 1er Cru. For a blend of grand cru and premier cru, taste Champagne Collet-Cogevi’s Brut Millésime 2004. Enjoy the different colors of champagnes. Champagne Pannier has a Brut Rosé that had a Pinot Meunier stilll wine blended into it for color. Some people enjoy young champagnes while others like aged champagnes. Attendees will have quite a choice. The champagnes at the Grand Tasting have aged between 18 months and 84 months. 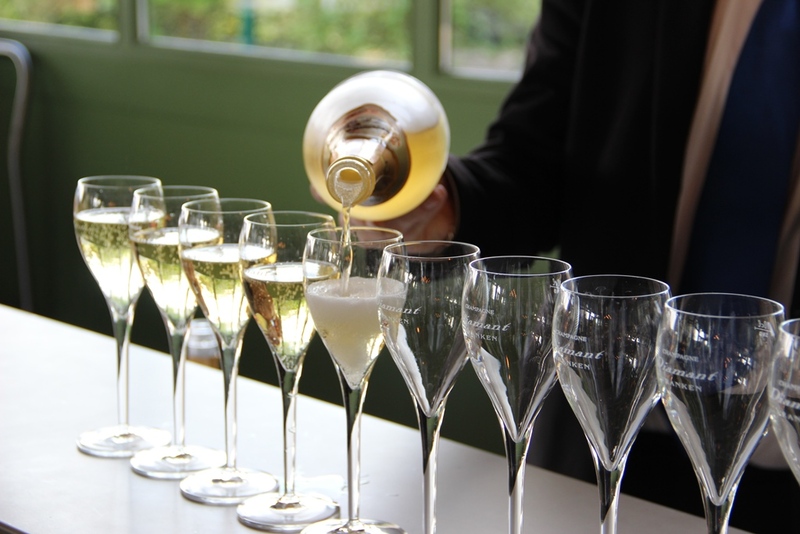 The majority of the champagnes served have ages between three and five years. Dosage varies between the different champagnes. For those producers that listed dosage, there is quite a range from four grams per litre to 25 grams per litre as in Champagne Collet-Cogevi’s Brut Art Déco and their Rosé Dry Collection Privée. While tasting the champagnes note if they are vintage or non-vintage. Participants can taste both styles. All three of Le Brun de Neuville’s champagnes are non-vintage. Three producers will offer vintage champagnes. With all the variables that go into crafting a bottle of champagne, there are certainly difference that participants can observe in the Official IWINETC Champagne Grand Tasting.